You've seen the image, but do you know the story? 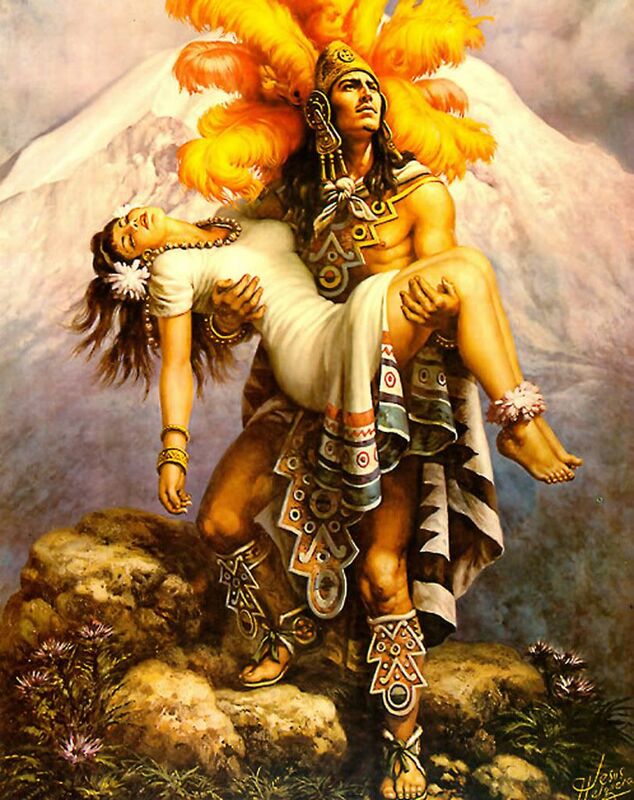 We've all seen the iconic image by Jose Helguera (on blankets, calendars, so many memes, the sides of buildings...) - a beplumed Aztec warrior carrying a beautiful maiden in his arms, behind them a tall white mountain. That mountain is actually the still active volcano Popocatépetl, which means "Smoking Mountain" in Nahua. On a clear day in Mexico City, you can see the peaks of Popocatépetl and his beloved, the dormant volcano Iztaccíhuatl, "The White Lady," rising 17,000 feet above sea level on the southeast horizon. This is the story of how these two volcanoes, one smoking, one sleeping, came to be. In pre-Hispanic times, when the Aztec empire ruled Mexico, a Tlaxcala warrior fell in love with his princess, a maiden of incredible beauty. His name was Popocatépetl, hers was Iztaccíhuatl; Popo and Izta for short. When Popocatépetl asked Izta's father for her hand in marriage, he agreed, but only if Popo returned victorious from battling the Aztecs, with the heads of his enemies to prove it. So Popocatépetl went off to war, promising to return. After months of waiting, a rival of Popo's, in love with Izta himself, told the princess that her warrior would never return because he had died in battle. Heartbroken, Izta fell into deep despair. When Popo finally did return carrying the heads his enemies, he found a corpse instead of bride: Izta had died of a broken heart. Grief-stricken, Popo carried Izta's body to the mountains, where he laid her out and stood watch over her, day after day, night after night, until the snow covered them both and the gods took pity on them, transforming the tragic couple into the eternal peaks of Popo and Izta, the "Smoking Mountain" watching over the sleeping figure of the "White Lady," his love her smoldering for eternity. Rising Dangerous Birth Complications For Latinas!